Getting out of the city used to be a common dream, but now we all love New York. Words like “dense,” “walkable,” and “transit-oriented” are enough to make even the sternest urban planner misty-eyed. OK, we exaggerate. But, clearly, the appeal of building up rather than out is as high as it’s been in decades. What does that mean for places like Phoenix? In advance of the Zócalo event “Can Sprawling Cities Find Their Centers?,” we asked some urban planners, economists, and journalists to weigh in on the subject. 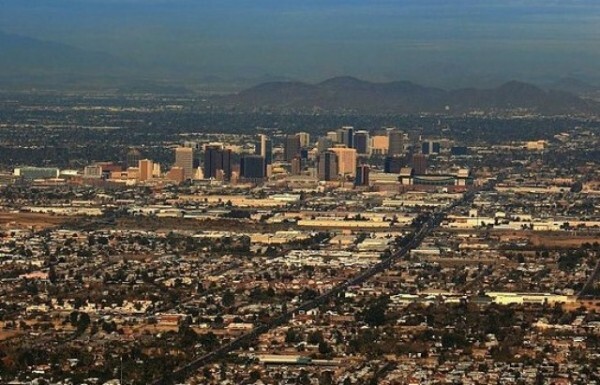 Is it imperative for sprawling cities like Phoenix to go vertical and become denser–and if so, how should they do it? Cities don’t make these decisions. Individual developers make decisions about their own properties, and the aggregate of these individual decisions determines a city’s density. True, there are collective decisions such as zoning regulations that influence what developers are allowed to do with their property. These decisions have been the cause of low density in the past–for example, the zoning of areas for single-family detached homes. They prevent developers from certain types of development, but they never require anyone to build anything. Regulations that are too costly and cumbersome result in empty undeveloped, or abandoned, property. Markets will coordinate individual decisions if regulators step out of the way. If people want high-density walkable cities, they will pay for high-rise condos and apartments, and developers have every incentive to build them. A city’s overall density will be the response of individual developers to the demands they see for different types of housing and commercial development. Looking around the world, we can see that nations that rely more on markets than government planning give their citizens a higher standard of living. Markets are just as effective in allocating land to various uses as they are in producing goods and services. Randall G. Holcombe is a DeVoe Moore professor of economics at Florida State University. Cities sprawl because they can. The economics of land development dictate a particular pattern of growth that planners love to hate: the further you get from a city center, the lower the cost to build, hence sprawl. Distance is the key variable in this equation. But distance is not absolute; going one mile in a car is different from going one mile by foot. Allowing residents of a metro area to rely less exclusively on auto travel helps to keep a metro area more compact and dense. If the transportation infrastructure is a rich and diverse network of roads, rails, and bike paths, then you can expect even more compactness and density. Sprawling cities like Phoenix understand this and are embarking on major investments in improving transit and walkability within their region. As the jobs, housing, and shopping of Metro Phoenix are increasingly located along this network of multiple modes of transportation, sprawl is decreasing and more people are able to live in walkable, transit-oriented, mixed-use places. Imagine being able to get from Location X to Location Y by car, or by transit, or by bike. Imagine if that were true about going from home to work, work to shopping, shopping to school? Right now, it’s a reality in many European metro areas and a growing reality in cities like New York, Chicago, San Francisco, and Portland. With good planning, sprawling cities like Phoenix can create such a multi-modal system. Real estate developers will always be willing to build outside this kind of transportation network, so sprawl cannot be entirely constrained (though urban growth boundaries, greenbelts, and transfer of development policy tools can help). But instead of trying to stop sprawl on the periphery of regions, planners ought to invest within metro areas to build the kind of transportation system that encourages just, sustainable, and vibrant communities. Justin B. Hollander, PhD, is an assistant professor of Urban and Environmental Policy and Planning at Tufts University. He is the author of Sunburnt Cities: The Great Recession, Depopulation and Urban Planning in the American Sunbelt (Routledge, 2011) and two other books examining the challenges of planning for post-industrial, shrinking cities. You can follow him on Twitter: JustinHollander. Early in the 20th century, when J.P. Morgan and his ilk called the shots, Lewis Mumford declaimed, “The metropolis is the urban form of finance monopoly.” In our own time, galloping sprawl reflects our uncritical embrace of all things mega, from Hummers and McMansions to obscene levels of wealth accumulation in ever fewer hands. Nowhere is this bubble-fueled fantasy of unlimited growth more on display than in the sprawling metros of the Sun Belt. Postwar suburbanization–a term that now sounds quaint–was hardly the result of “the market,” and markets alone will not correct the excessive horizontal build-out of the past 20 years. “Sprawl by law”–the plush complement of mandates and incentives that underwrites fringe development–continues apace, subsidizing exurban highway expansion and ever newer, more shoddily constructed commercial buildings, leaving independent businesses and cities to fend for themselves. With Reagan-era de-federalization, power to dole out real estate and infrastructure subsidies devolved to states and localities, where the proceedings became even less transparent. Given this history, we have to conclude that exurban land markets are neither “free” nor accountable, that sprawl has been financed by you and me–the taxpayers. How might the Phoenix metro reinvent itself in the era of global warming and economic contraction? I can propose three principles. The first is to avoid the one-model-fits-all-cities approach. Phoenix can no sooner model itself on New York than Dayton can. The second principle is that climate change requires all metros to take inventory of their resources and plan for new conditions. Phoenix faces severe water shortages, for example, and offers little in the way of non-automotive transportation or mixed-use housing. Zoning and code reform could facilitate neighborhood-level development models for those who want to live, work, and play without being forced to drive, while taking development pressure off the water supply and harvesting the very solar power that parches the land. Which neighborhoods at what level of density? Only Phoenicians themselves can say. Which brings us back around to a third principle, and this one concerns the volatile matter of political will. Any serious conversation must move beyond the false contrast between “markets” and “the state.” Pure market choice is an illusion. The question must be–as it always has been–what should taxpaying citizens choose to subsidize, and why? The shadowy real estate transactions that have long been the lifeblood of sprawl exact a high price, not only environmentally, but also economically. The citizens of Phoenix should demand transparency and an honest accounting of the costs of sprawl, for, as in all cities, they will have to make painful, hard-headed, informed tradeoffs in the years ahead. Historian and journalist Catherine Tumber is the author of Small, Gritty, and Green: The Promise of America’s Smaller Industrial Cities in a Low-Carbon World (Cambridge: MIT Press, 2012). Don’t go vertical. Go programmatic. It is not necessary for cities to “go vertical,” particularly in places where views of the natural landscape and outdoor lifestyles are strongly valued. While sprawl is detrimental to quality of life and to the environment, density comes in several flavors: building, population, and programmatic. Mistakenly, in the quest for urban and ecological vitality, many planners work toward achieving building and population density, when it is actually programmatic density–the adjacency of uses–that is most critical. As Jane Jacobs observed in 1961, cities need “a most intricate and close-grained diversity of uses that give each other constant mutual support, both economically and socially.” Programmatic density–sometimes described as “cross-programming” or “programmatic integration”–can be accomplished through deliberate interventions by designers, planners, and developers. Or it may occur more spontaneously and serendipitously through the creativity of small business initiatives and residents. Some contemporary integrations recall pre-industrial ones, such as housing above the store and live/work spaces. Others are pre-industrial with a twist, such as housing above the big-box store (e.g. Walmart, Best Buy), time-share condominiums, the movie theatre/restaurant, bookstore/coffeehouse, the urban plaza or parking lot by day/outdoor movie theatre at night, and advertising integrated with buildings through murals, billboards, and animated screens. Others still are completely of the moment. Such emergent examples of cross-programming include the office with basketball court and daycare center, the intergenerational community building (combining day care, teenage community center, continuing education, and seniors center), the public school/community center, the integrated parking structure (parking blended into buildings, retail centers, and parks), the cybercafé (sometimes combined with computer retail as well), the laundromat/music club, and the Dive-In (watching movies while floating on rafts). This low-density urbanism translates into reduced commuting, greater convenience, increase in quality public space, more social interaction, greater social capital (trust), and preservation of the natural environment. In the quest to improve our places, we may take cues from the pre-elevator, pre-automobile, pre-telephone city, improving upon it all the while with 21st-century construction, transportation, and communication technologies. Nan Ellin, PhD, is Professor and Chair of the Department of City and Metropolitan Planning at the University of Utah. This is adapted from her forthcoming book Good Urbanism (Island Press 2012, islandpress.org).